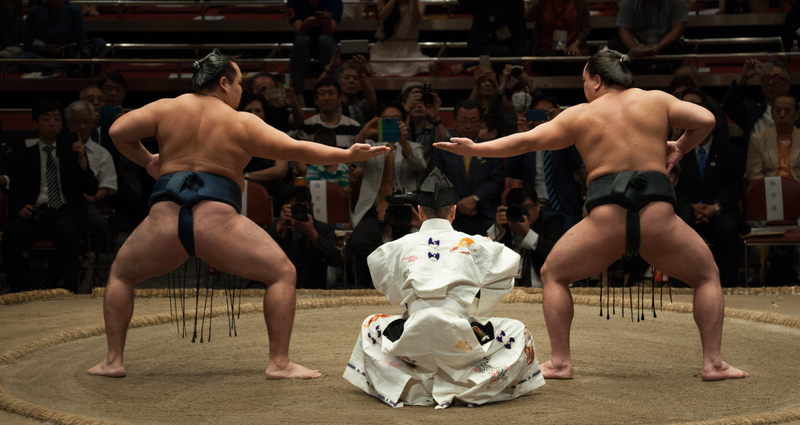 The Japan Sumo Association will hold an Ozumo Beyond 2020 Basho at Ryogoku Kokugikan on Oct. 4 for the second straight year. The event, which will feature many of the same activities found on regional tours, as well as some that are rarely seen, is part of a government-funded project to raise awareness and understanding of Japanese culture among foreign visitors and residents ahead of the Olympic Games. Because of that, explanations will be provided on the day in English both through a pamphlet distributed to guests, and in-house commentary. The schedule is shorter than the full-day 2016 version, with this year being just a two-hour show from 1 p.m.
Tickets are not being made available to the general public, but instead are being distributed to media organizations, embassies, foreign schools and associations. The Beyond 2020 Basho also serves as the unofficial start of the winter regional sumo tour that is comprised of 22 events winding across 18 prefectures through Oct. 29. Of particular interest to sumo fans on Oct. 4 is the fact that a sandan-gamae ceremony will be performed by two yokozuna. This is extremely rare, with the 2016 one between Harumafuji and Kakuryu being the first in 21 years. This year, Hakuho and Kisenosato are rumored to be the pairing, but with both yokozuna sitting out the entirety of the September tournament that may change. 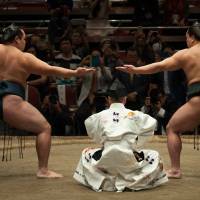 A sandan-gamae essentially is where two yokozuna simultaneously take up three positions on the dohyo. It’s a very simple ceremony but its rarity alone makes the event a must-see. 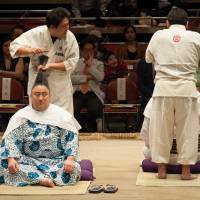 In fact it’s so rare that not only do most sumo fans never get to see one, but most yokozuna never get to perform one. Even Asashoryu, one of the all-time great champions, saw his career come and go without one being scheduled. The last time a sandan-gamae was performed at the Kokugikan was in 1985, when Chiyonofuji and Kitanoumi marked the opening of the building. 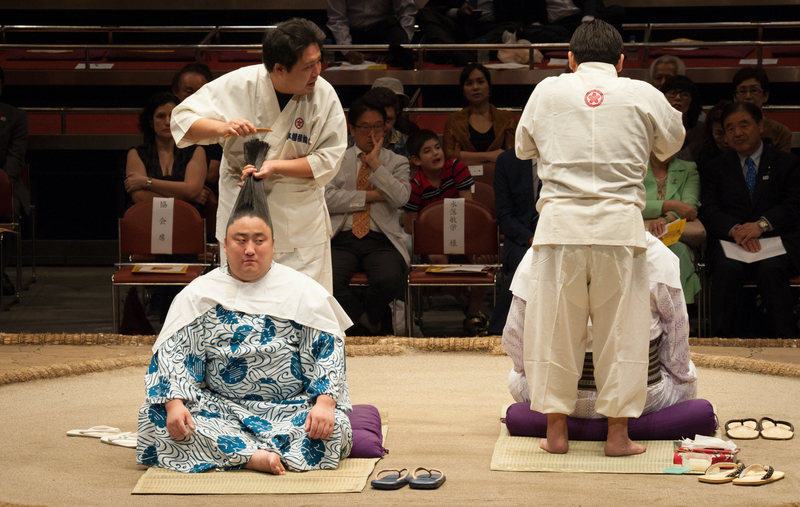 In addition to the sandan-gamae, there will also be a demonstration showing how the topknot is created. Last year, two rikishi sat in the ring facing in opposite directions, which allowed audience members to get a complete view of the complex procedure from all sides. 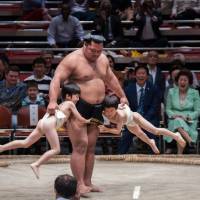 A ring announcer will also perform traditional sumo drumming and some top-division wrestlers will do sumo with children. That usually provides the greatest levity of the day as the giant men run around the ring chased by kids, and finish off taking on about 15 of them all at once. The relaxed and fun nature of the 2016 event, with rikishi being encouraged to interact with fans and everything being explained clearly, generated such positive feedback that the sumo association decided to run a repeat of what was initially meant to be a one-time event. Last year, many of the top rikishi sat among the audience members, chatting and posing for photos, which obviously is something that never happens during a regular tournament. If you’ve ever wanted to talk with one of your favorites there is no better opportunity than on Oct. 4. Of course the event also serves a more practical purpose with the ministry in charge of the Tokyo Olympic and Paralympic Games and the Japan Sports Agency funding it partly as a test run of multilingual services and barrier-free environments ahead of both those events. 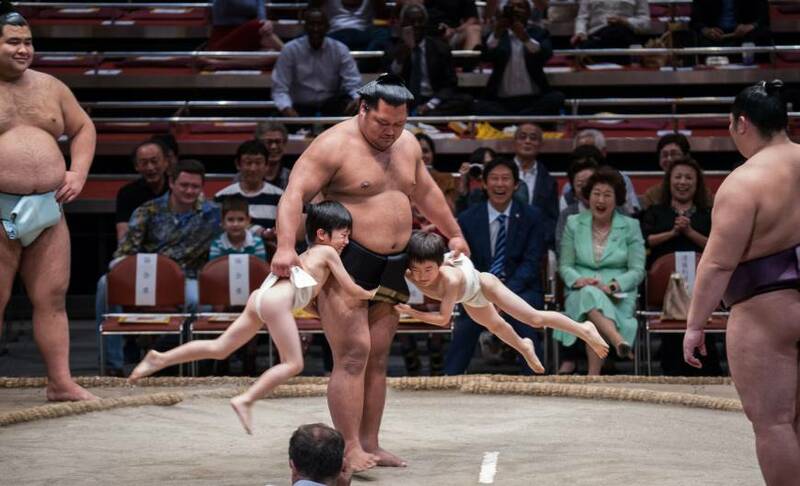 In that respect, the sumo association is actually more advanced. Prior to the recent surge in the sport’s popularity that has made tickets difficult to come by, foreign fans were gradually becoming a much larger presence at honbasho. The association responded with various measures including having more English-speaking staff on site and providing food items that would be familiar to Westerners. The JSA has also fully embraced social media over the past few years, and used last year’s 2020 basho as an opportunity to estimate its reach among a non-Japanese speaking audience creating a special hashtag for the event and asking those present to use it when posting online. The exact details of this year’s event haven’t been publicized in advance and this year seems to be much lower key than last. The basho, however, will be shown on television and footage made available later as one of the conditions on the back of the tickets (also in Japanese and English) is that spectators consent to the use of their image in live footage and on social media. And finally, as an acknowledgement to the generally larger size of foreign visitors, each masu (box) will only have two places rather than the usual four, making it a much more comfortable viewing experience than normal.